Today I've got a lovely franken to show you. A while back I was clearing out some polishes that were dupes to others in my stash, and among them was Joe Fresh Moss (which is a dupe/too similar to Zoya Shawn). I also had some CND Copper Shimmer left (I've used this to franken before) and figured they might look pretty together! I used an old style Essence bottle which holds 5ml. I filled it with Joe Fresh Moss and left around 1/4 free to add the CND. I also used a stainless steel ball for mixing (I had 2 left from a polish I knew I was throwing out, so I took out those). 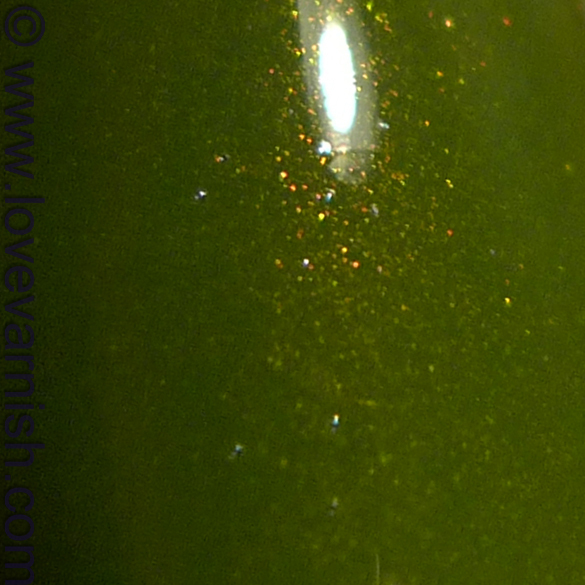 I filled up the bottle with CND Copper Shimmer and started shaking. After letting it settle for a night, I meant to put it on immediately. I forgot about it.. and just now I rediscovered the shade! I needed 2 coats and the coppper shimmer is shy, but visible. I absolutely adore it! I named it A Coppa Mossacino. Bit cheesy but hey, companies get away with it too right ;-)? Do you like this franken? Have you ever created a franken yourself? Tell me in the comments! yep I love creating frankens! So fun! This is absolutely gorgeous, it turned out soo amazing! I love it! This is so gorgeous Deborah!!!! I absolutely love it!! I've frankened before, but it's been over a year. I should really try again. So freaking awesome! The colour is gorgeous, and the copper shimmer is just perfect with it! Very pretty! I usually franken by dumping glitter into things; your franken is much more refined than that, lol! Thank you Marisa, I love it too :D. Yes you should! I don't do it often enough myself. Haha well this was dumping shimmer into things, so not much difference there ;-). The minty one you mean? I still want to create a franken with a dusty mint and copper shimmer ♥. Thanks for your comment! Dear Lord of the Rings, it is a perfection! GORGEOUS green! It can be messy but this kind of frankening (more mixing 2 polishes) isn't as troubling :).